An elegant mid-length jacket. Kalamkari natural dye prints edged with embroidered piping. • Length: PM 34" M 36"
Beautiful and well made! Unfortunately I ordered the wrong size and am going to have to give it to someone else. The Reversible Long Amulya Jacket is now my go-to jacket for every occasion. I would not have bought it if it were not for the ROOMY PATCH POCKETS on each side. The pockets made the sale. I wore the multi black side of the jacket over a black turtleneck and black leggings to a wedding. For the holidays I wore the red multi side over the same black turtleneck and leggings. The jacket is very well made and extremely comfortable. I'm 5'3" and ordered a 1W size to have enough room over clothes worn under it. I did order another similar jacket, but in 2W because most of the MarketPlace runs a bit small -- at least for me. Sometimes I need to order 2 sizes up. 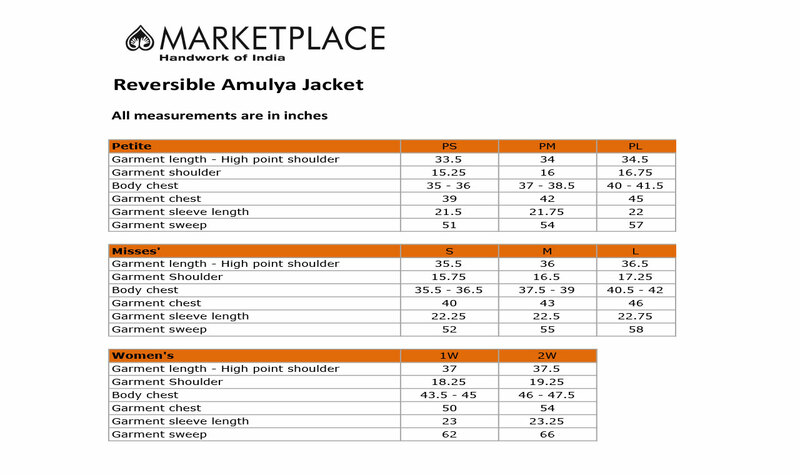 I hope more jackets like the Reversible Long Amulya Jacket will be made -- especially with the roomy patch pockets. I love it. It's lively and comfortable and pairs with many colors. Medium size was perfect for me ( 5' 6" - 150 lbs). I bought it to wear for winter holiday gatherings. I received many complements, and everyone wanted to know where I'd purchased it. I thought that might happen, and I had kept the tag in the pocket so I could easily show friends. I have bought several reversible jackets from Marketplace over the years and have always been happy. This is no exception . The fabric here is really beautiful and I love the way the cuff folds back with a little notch. I was a little disapppointed by the weight. Previous jackets seemed twice the weight and worked in cool weather . I would have preferred that. Nonetheless I am delighted with this version and have already worn it twice. I love my new jacket. It is true to size and I really like that it's reversible. Both sides are made of lovely fabrics. I expect to wear it all through the Fall and maybe even over a sweater in mild winter weather. I think the price was reasonable. If you're thinking of buying one, don't hesitate! This is a beautiful coat, in such practical colors! The red has a fair amount of gray, with a little blue trim hand sewn. The black has blue-and-white flowers, with a bit of blue embroidery. The garment is light-weight. I view it as a year-around piece - as a light coat in spring through early autumn, then worn as a jacket over blouses and dresses during the winter months. It can be warn over dressy clothes for concerts, parties, and such, but will work equally well with slacks or even jeans for more casual events. A highly versatile purchase!